L'Oréal Sparklicious is my second pick from the new Diamond Collection. It would have been part of yesterday's post, but The Bigger, The Better stole the show. 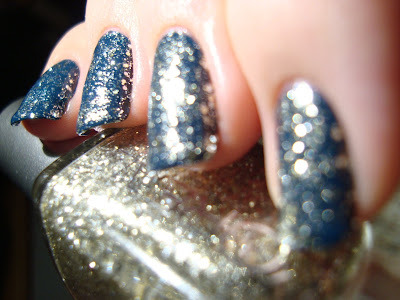 It would be unfair to hide such a sparkling beauty under six photos of another polish. Sparklicious deserves a spotlight of its own! Sparklicious is a real rival for the title of my new favorite glitter! This is just one coat. I've seen it worn on its own, it's that packed with glitter. Despite all of the glitter, it was still pretty easy to apply and smoothed completely with a coat of Gelous and my usual top coat. It's just so vibrant! It's somewhere between silver and white gold and ideal for xmas. It's like a metallic blizzard! The glitter has such an incredible shine to it that it dazzled my camera at some angles. It's also multiculturally versatile, as perfect for Chanukah as for xmas! I might wear this combination for latke night with my family. I can't wait for Mom's latkes and sour cream! Mmmm! ...and I will almost definitely be using Sparklicious in some of my xmas manis. It's too perfect. L'Oréal is really wowing me lately!